We have had a hard time this fall finding enough people who could meet at the scheduled time for the regular IFS Basic Course. So I decided to offer the Basic IFS Course in this new format. The Basic IFS Course teaches you how to access Self and work with protectors. It is the most basic course on IFS. It teaches you how to work on yourself using IFS and how to do peer IFS counseling with other people in the class. Therapists and coaches also take the class to learn about IFS, though it is not professional training in IFS. The course is experiential; it includes practicing IFS sessions for homework in pairs. The text for the course is Self-Therapy. This is a six-week course that uses the recorded IFS Course from our online store. You work together with a group of people who are working through the recorded course and pairing with each other for the homework practices. There will be an online forum for you to communicate with the other members of the class and with me. I will be available through the forum, or by phone, to answer any questions that come up. This format is ideal for people who can’t make the time that is scheduled for the regular Basic IFS Course or who want to take it when there isn’t a regular Basic Course scheduled. Cost: $15 plus the recorded course, which is $75. Email me at earley.jay@gmail.com if you would like to take this course. 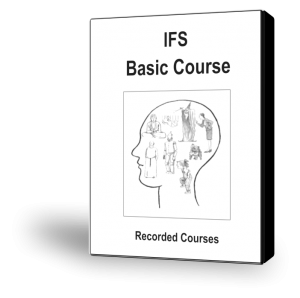 Click here for a fuller description of the Basic IFS Course.